Wallaby memories The Roaches Peak District. I had been studying the wallabies for 40 years, from 1969 to 2009. One correspondent queries which species. Red-necked Wallaby Macropus rufogriseus, but specifically the Tasmanian race Macropus rufogriseus fruticus, also known as Bennett's Wallaby. 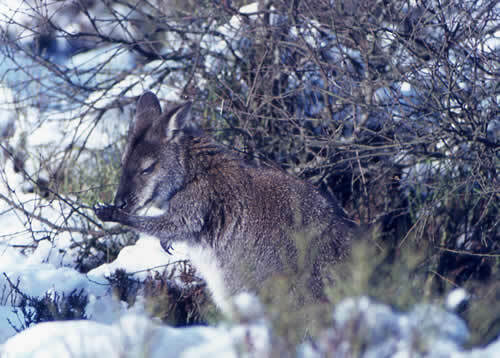 This is important, because the Tasmanians have seasonal breeding (here, births mainly in August, emerging from the pouch mainly in May) whereas mainland Autralian Red-necked Wallabies breed all year; not well adapted to our climate! The colony started with two from Whipsnade bought in 1936, and five were released in 1939/1940. Genetically, they must be rather inbred. Riber Castle released an extra male "to improve the genetic variability" in 1978, but when I suggested that he, too, had come from Whipsnade, I received no denial. He was actually released as a publicity stunt. Wallabies (and other kangaroos) can be aged, roughly, form the fact that their cheek teeth move forwards in the jaws as they get older. On this basis, the oldest skull I obtained from a Staffordshire corpse was about 12 years 3 months old. However, the white-faced female shown in the 2009 pictures from your correspondents was actually born in 1996, so she was certainly 13 years old. Her mother also went very white-faced before she disappeared, in 2004, and I thought she was older than that. The last male died in February 1996 (the female would have mated the previous August). The last evidence I have, personally, is of droppings found in Feb 2009. There is a story that she was seen at a farm somewhat later than this, having moved off the moors, but I have been unable to confirm this. I am quite sure she was the last of the original colony. I am quite prepared to believe that there have been more recent sightings, but someone has been surreptitiously (and illegally) letting wallabies go, in that case. There are still small colonies of the same species on islands in Loch Lomond and on the Isle of Man, but they also turn up in a very wide range of other places: they breed well in captivity, or semi-captivity, but seem quite adept at escaping, too. The wallabies depended largely on heather (especially in winter) and grasses (in summer) for their food, but the more nutritious young heather, produced by gamekeepers burning the moors in small strips, became less and less available, and I think they ran out of decent food. However, accidental deaths, on the roads, falling over cliffs and (especially in 1962-63 and 1979) severe winters also took a toll. Why should a wallaby venture onto the roads, or jump over a cliff? Probably because a certain section of the public seemed to respond to a sighting with "let's chase it", or their dog did. They always were very timid, and I watched them panic both to thunder and to the terrifying sight of a sheep arriving. I never saw more than 5 together, usually just one or two. They did not seem to have any formal herd structure, nor any precise attachment to an obvious "home", as hares do to their form. They usually sheltered between clumps of heather or bilberry. I got the impression that in summer they disappeared inside big bracken patches, but it was impossible to check this - you just saw the bracken moving ahead of you. There is a formal account in The Mammal Society's handbook on British mammals, and a couple of short papers in Journal of Zoology. In 1958, or thereabouts, I was with a group of rock-climbers at The Roaches when we were delighted to see one of the wallabies we had heard about hopping out of the bushes below the crag. On another occasion around the same time, we were walking along the moorland at the top of the crag late one evening when the yak appeared looming up out of the mist. We knew there was one, but to see it walking towards us was somewhat hair-raising, although I think it was just a wary of us as we were of it. Many years ago, perhaps late 40`s early 50`s, my Dad, my Uncle, me and my sister were collecting bilberries on the Roaches (where Uncle Jack and Aunty Agnes Plant had a cottage) when we heard the sound of galloping hooves and saw an enormous horned animal charging down the hill towards us, we all screamed, panicked and ran, convinced that we would be trampled to death. . When we were at a safe distance we saw that the Yak was actually in an adjacent field to the one we had been in and was grazing quite happily. A truly magnificent beast! Just another thing,the Plants had problems with wallabys who would come into the garden like marauders, eat the fruits, flowers whatever they could find and generally wreck the garden. Aunty Agnes said they would sometimes drag washing off the line and strew it all over the place. Uncle Jack would come out with his shotgun and fire it into the air, the Wallabys scattered but they always came back. I’m now a resident of Japan, but this is an old story from the 1970s. My home town is Leicester and I was in a scout troop at my school. We stopped at Back Dane Cottage several times between 1971 and 1973. You had to walk to the cottage from Dane Bridge and then start the old generator to get electricity. Most of the time we used hurricane lamps. It was a spooky place and we entertained ourselves by telling some great ghost stories. We went climbing at the Roaches and spent hours hiking the trails up on the moors around Lud’s church, which often featured in our ghost stories. The other fascinating thing was spotting the wallabies. At first I thought people were pulling my leg and this was just another story, when they told me about the animals. However, the visitors book featured numerous sitings. I was thrilled when I actually saw them on the moors at the back of the Roaches. I remember seeing groups of as many as ten of them on a couple of occasions. I was saddened to hear they had died out after thriving for so long. I am heartened to hear of recent sitings. However, it is depressing to think when large mammals reach those numbers, long term survival is probably unlikely. I was very interested in the siting of a Wallaby near Luds church this year. Here is a picture from 1975 in the same area. We saw 2 Wallabys at that time in 1975 - I think around May just before the leaves returned to the trees but unfortunately do not have the photo of the two wallabies together. I look forward to our next visit! 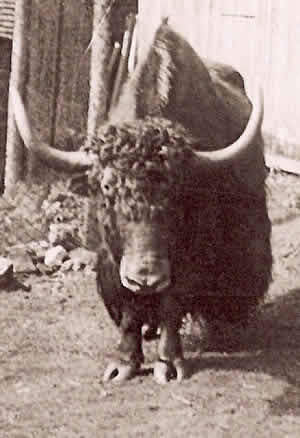 This is a photo of the Yak - date unknown. It looks as though the animal is in the field across from what is now the Roaches Tea Rooms. It is obviously behind a pretty substantial fence. (photo owned by Ivy Goodwin of Pheasants Clough Farm the Roaches). I came across one whilst walking through Lud Church in July 1987.At the bottom end there was at one time a huge bolder over the entrance (Which has since been removed for safety reasons).I climbed up the stone steps and went round the last corner of the chasm and there was a wallaby about 10 feet away. For what seamed to be an age we both stared at each other until the creature turned slowly away and hopped off into the Bilberry bushes towards Castle Cliff Rocks. This is the one and only time i have ever seen one having walked on the Roaches for many years! I found your website after my daughter asked whether there were still wallabies at the Roaches. I used to spend a lot of time at the Roaches and surrounding areas from the mid 70's to the late 80's. Once whist rock climbing in the Skyline area - mid year and probably around 1977/78, I was sitting at the top of the crag watching my second slowly ascend when I noticed a VERY large "rabbit" hop out of the undergrowth and continuing eating directly below us - probably only 30 ft away. An exciting time as it was my first, and unfortunately only, time that I saw one of the famous Wallabies. I also remember talking about this with Douggie (Lord of the Roaches) and just how many he had seen at various times. It would be nice to think that there still are wallabies around the Roaches & Back Forest areas. The article about the crashed German aircraft was another piece of local knowledge that I was aware of. I knew roughly the area of the crash but never successfully found it. Another crash site that I did visit was along the ridge between the Tri-point and Bearstone Rock on the slope overlooking Moss End Farm. This was probably around the early 80's when the scorched ground could still be easily seen. Pieces of melted aluminium(?) and on one occasion an exploded .303 round (I believe) from a machine gun on the plane. The end of the bullet stamped 3R & 44 - the 44 indicating the year. I believe that the plane was a Wellington bomber. Thanks for in interesting site, hope my memories are of interest. I was interested to come across your wallabies page, as I thought the animals had all died out. 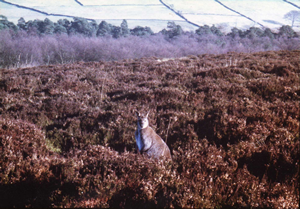 I first saw the Roaches wallabies in 1960 thereabouts when I was walking in a mist on the Roaches, and was suddenly confronted by what looked like a giant hare! It bounded over the edge into the woodland below, where there were about six more of them. I returned on several occasions and managed to take several photographs of them, though they moved too quickly to get really good shots. 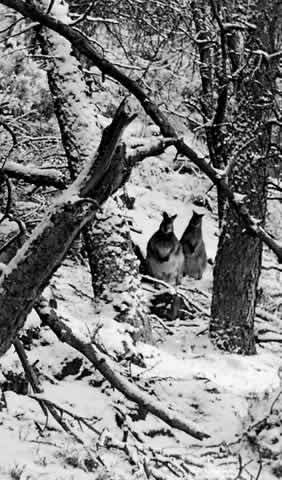 I am attaching three of these, taken in 1962, together with a shot of wallaby tracks in the snow. We also found a dead wallaby on one occasion. The area was covered with wallaby tracks in the snow on these occasions. I always thought that the wallabies were Yellow-footed Rock Wallabies, so would be interested to know definitely what species they are. Just looked at the website – very good (keep it going). Here is a memory of mine. In the winter of 1977 (November?) myself and a colleague were driving back from Manchester to Leicester in the dark (after a long day – and it must be said a few pints). On the A53 around Naychurch, suddenly a 'kangaroo' appeared in the headlights and 'bounced' across the road. A deathly silence ensued in the car until, after a few minutes, my passenger said – 'did you see that'. Only then did we both 'confess' that we thought we had seen a 'kangaroo' crossing the road. When we were unwise enough to share the tale with our colleagues at work the next day they teased us no end!! In the following few weeks (in the days before the internet, of course) I visited the Library in Leicester and found out about the Wallabies and only then did we know that we were sane after all! The following spring I visited Roach End and saw the Wallabies again (7 in total – in three groups of 3, 2 and 2). I was student in Manchester in the 1970s and I wrote my dissertation on the area. I met the wallabies on many occasions so I thought I’d send you a picture. skip afternoon classes and walk over from Wincle to Lud's Church. enough we all crept up and way before we got close it simply hopped off. Tremendous, I still remember the day with delight. Congratulations on your fascinating web site. I only came across it by accident when I was looking for information on wallabies in the Peak District. Walking magazine had written their article and I was about to write and say it was a load of rubbish – because I had heard that a Manchester professor, who had been studying them, had said recently that they had all died out. Imagine my surprise, and thrill, to find that they are still alive and kicking! I saw one in the heather above Lud's Church – once – probably twenty years ago! In about 1959 or 1960 when I was walking with my schoolfriend, Ian Hepworth, near Shutlingsloe, we saw one or two wallabies. I think that we saw them on more than one walk in that area, and possibly nearer to Three Shires Head, in the 1960s. During the early 1980's my husband spent a weekend with the Territorial Army in the Peak District. On waking up very early one morning he couldn't believe his eye's when he crawled out of his tent and saw a group of three or four wallabies. I was telling some work colleagues of his experience the other day when they all laughed at me telling me not to be so silly. So I decided to google it and see what came up. I am so glad that i found your site as even i was beginning to doubt him. I have printed off this page so that i can prove them all wrong at work on monday. Always searching web pages on the Peak and luckily found your very good web site. Always remember my first introduction to the area--it was a field trip from Kings School -bus to Cat & Fiddle--walk to 3 shires-swim in panniers pool--continue to Gradbach--Luds Church and over Hanging Stone for pm bus from Wincle. As a 13 year old I was completely taken by the area and spent many hours in the next months exploring the area. I am certain that I saw my first wallaby (to me it was a kangaroo) in a clearing in the wood between Luds Church and the river in 1957. I continued to visit the area until my departure to Canada in 1981. Over the years I had many observations-although some years were very lean. Have a record of one walk--coming out the far end of Luds Church saw 3--sitting quiet in the heather, one passed me with a joey. Heading to roach end saw 2 more. Went over 5 clouds and going in the derelict woods below observed 4 more.This was in 1968 or 1970. In the late 70's when the estate was sold ( I attended the sale at Macclesfield Town Hall and still remember the scene of some tenant farmers losing their farms) and many sheep than should have been allowed roamed the area, I think that the Wallabies were affected and got dispersed--some were seen in the lower valley of the Dane below Wincle. When the Peak Park finally got involved, I had the chance to be in charge of the part time Rangers covering the area, so spent many hours from 1979 to 1981 in the area. 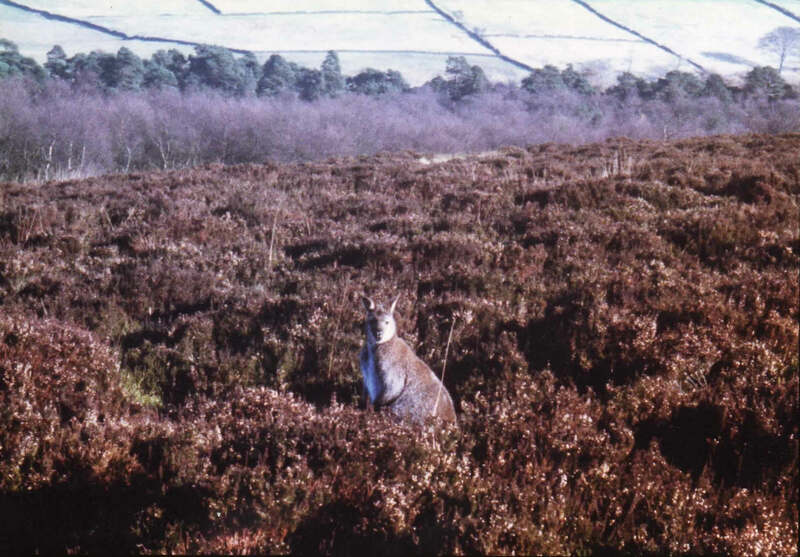 Never saw any Wallabies at Hen Cloud but the people who used to live at Roaches House said they would see the odd one. The main area seemed to be in Back Forest at the edges of the woodland/moorland. Would see 3 or 4 sometimes and other days nothing--you got down wind from them and they came close. At the time there was too much publicity and you would get groups of noisy people on Wallaby hunts. I also used to count deer (originally from Swythamley estate) within the Dane area (mainly from the A523 to Danebridge) and sometimes at 6 am you got good numbers (had to watch for one farmer who never wanted anyone on his land). Also used to cover Gun Hill and some woodlands as far as Big Wood. On one occasion saw a wallaby in Gun Plantation -think about 1974/1975. Glad to hear that some may still be alive-although the main feeling is that they had all died out by 2000. There were 3 Yaks - a bull, a cow and a calf. 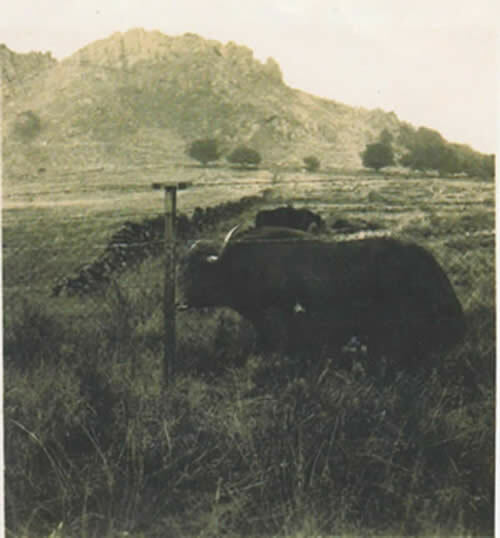 The cow and calf both died in the appalling winter of 1947. The bull died in 1956. I remember a Yak on the Roaches when I went to visit my sister. I must have been between 10 and 12 years old so that would put the date at 1959 to 1961. Joe Gold who used to live at Well Farm at the back of Hen Cloud can remember there being 3 Yaks - an adult pair and a young calf. They used to roam around Hen Cloud rather than the Roaches because unlike the Wallabies they could not jump the walls! One, presumably the calf, lived into the 1950's and was on it's own for a number of years. It once wounded a pony- which shared the land-with it's horns. The wound was under the belly about 2ft long and deep. The pony survived. In about 1988 my son was driving home late one night when a wallaby jumped over the wall on Roach Rd right onto his bonnet. The wallaby was injured so he drove about a mile home(at breakneck speed), related the situation to me and I phoned the vet. The vet arranged to meet us at the practice( Moorland Veterinary Centre in Leek). We rushed back to the Wallaby which was clearly in bad shape. My son scooped up the Wallaby and got into the back of the car - we needed to curl the tail carefully- they are a big animal. I sped off down to Leek. Unfortunately half way there the poor animal died. The vet briefly examined the corpse and found it was a female with a little joey in it's pocket. Tragic. In 1963, which was an exceptionally cold winter with day time temperatures below freezing for a number of weeks, I fed hay to the wallabies along with my sheep. However at the end of the cold spell, one night the foul weather returned with a vengence and the next morning I found 13 dead wallabies behind the north wall bordering Rock Hall wood. This is the same wall which has recently been renovated using a helicopter to cart the stone. 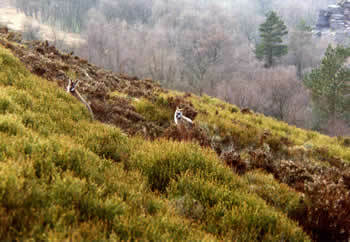 In July 2001 I saw a wallaby grazing by the concession footpath that leads from Lud Church to High Forest Ridge. It was only about 10yds away. On trying to get closer it kept the same distance of about 10 yards.